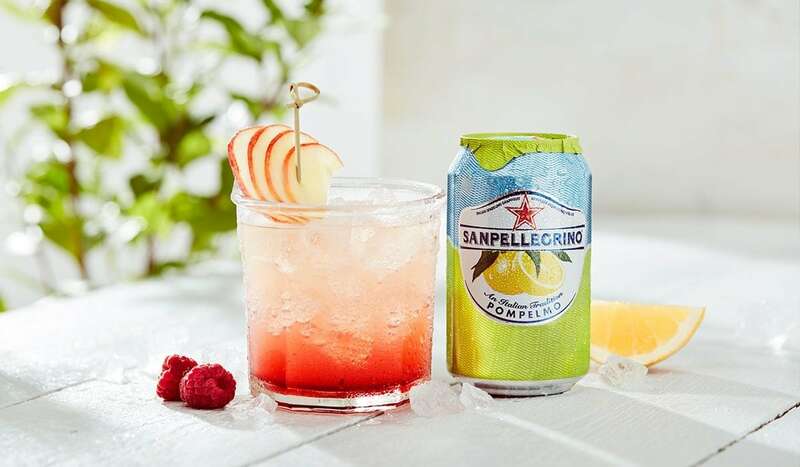 Dress up your favorite sparkling grapefruit drink, Sanpellegrino Pompelmo, for your next summertime brunch with this festive version featuring apple and raspberry. It will liven up any friendly catch-up with its crisp fruity flavors and good looks! Bittersweet and zesty Sanpellegrino Pompelmo shines in this mocktail, the Pompelmo Splash. Fresh apple juice keeps things light whilst raspberry syrup gives the Pompelmo Splash a subtle sweetness that slides on your tongue, but also lends a color that makes this fit for even the most elegant affair. Fans of Sanpellegrino Pompelmo’s intense flavor of fresh sun-ripened grapefruit will not be disappointed, the Pompelmo Splash will make your friends linger for one more glass. Keep them happy with some stuffed zucchini flowers and crostini with cannellini on the side! Fill a large, sturdy glass (14 oz capacity) with ice cubes. Gently pour the juice and syrup, followed by Sanpellegrino Pompelmo. Stir until combined using a bar spoon. Garnish with a piece of caramelized apple. If you are 21 years old or over you can turn the Pompelmo Splash into an alcoholic drink by adding 1 ½ oz of sake.